Norman Gordon photographed recently while holding court at his golf club. Cricket is a sport where milestones and statistics are of great importance. Many of these records surround the century mark and as I write this piece the cricket world is intently watching Sachin Tendulkar, waiting for him to record his hundredth international century. As and when that is achieved, and it may well be in England in the course of the next few weeks, it will be a unique achievement and one which may well, short of a sea change in the way the game is played, remain unmatched in perpetuity. For now however Sachin can surrender centre stage, for a few days at least, to South African Norman Gordon. Their cricketing records may not be comparable but, although Sachin does hold a few age-related records, he is as yet a long way from matching Norman’s achievement today in becoming the first Test cricketer to celebrate his hundredth birthday. Unlike the mark Sachin is about to set one would hope and expect that others will join Norman in years to come, although he will certainly be alone in his achievement for some time given that the next three in the list, fellow South African Lindsay Tuckett, Englishman Reg Simpson and West Indian Andy Ganteaume, are mere striplings of 92, 91 and 90 respectively. As a cricketer it has to be conceded that Norman’s figures are relatively modest, although he was undoubtedly a better player than mere statistics would indicate. A right arm pace bowler he made his bow in First Class cricket in December 1933 at the age of 22. He bowled, as third change, thirty wicketless overs in a game where his side, Transvaal, were demolished by Natal by 309 runs. It was to be four years to the day before he was selected again and in that 1937/38 season he came right to the forefront of cricket on the veld, taking 39 wickets at just 16 apiece. With the domestic First Class competition, the Currie Cup, not being played in 1938/39 due to the MCC tour Norman’s achievements the previous year put him in pole position for a place in the Test team. His first chance to impress the selectors came in the tourists game against Transvaal. He took only one wicket but bowled what was described as a long impressive spell, and in fairness to him his one victim was the one to have, as a rapidly lifting delivery caught the edge of Walter Hammond’s bat and the MCC captain was superbly caught in the gully. Duly selected for the first Test Norman recorded what was to remain his career best Test analysis of 5-103 in the England first innings. Writing in 1997 the late Brian Bassano said Gordon bowled superbly ….swinging the ball both ways, at fast-medium pace, he commanded respect from all the batsmen and made himself a certainty for the rest of the series. Norman took two more second innings wickets but the four day match petered out into a tame draw. In South Africa’s first innings of the first Test Norman found himself batting at the dizzy height of number five. Sent in as nightwatchman a man whose Test batting average was to end up at just two was out first ball. His being stumped by Les Ames from the bowling of off spinner Tom Goddard doubtless fuelling his captain’s regrets at his decision to promote Norman. It was an odd decision by Alan Melville to send him in at that stage, even if, as may be the case, he volunteered for the task. Norman’s lack of prowess with the bat was no secret and by the end of his career he was one of the few who have taken more wickets than they have scored runs, and his overall First Class average was just five. Perhaps surprisingly to followers of the game today despite his lack of ability with the bat he seldom batted last – his fellow fast bowler and provincial and Test teammate Eric Davies averaged even less and thereby made the number eleven berth his own – how times change! The third match of the series produced the only definite result, an innings victory for England. The visitors only lost four wickets, two of them to Norman, described by Bassano as the only South African bowler to emerge from the match with any credit. It might have been all square going into the final Test had the third days’s play in the fourth match not been lost to the weather. In their best performance of the series South Africa gained a first innings lead of 134 after dismissing England for 215 (Norman 2-47) but as a result of the rain’s intervention there was insufficient time left in the game to get a result and England ended up on 203-4 in their response. It could have been closer had wicketkeeper Ronnie Grieveson held on to an edge from Hammond, inevitably from Norman’s bowling, before the arrears were cleared. As it was Hammond played a captain’s innings and was unbeaten on 61 at the close. Norman had taken three of the four wickets that had fallen and was described as South Africa’s most dangerous bowler. And so it was on to Kingsmead for the fifth and final Test. In fact there had been plenty of timeless Tests before, and even another one in the West Indies that had to be left drawn lest the England side missed their boat home, but this game at Durban, which began on 3 March 1939 and ended on 14 March (nine playing days, two rest days and one lost to rain) has, above all others, come to be known as “The Timeless Test”. There have subsequently been other matches, normally the final Test of series that remain all square, that have had an extra day added, but no truly timeless Test has ever been attempted again. The game began with South Africa taking 202 overs and 13 hours to make 530. They then dismissed England for 316. This was Norman’s least successful innings of the tour and he failed to take a wicket, but by conceding just 82 runs in 37 overs he played his part in frustrating England’s batsmen. Although the follow on was available Melville, inevitably in the circumstances, chose not to enforce it and his batsmen ground out another 481 runs to leave England the seemingly impossible task of scoring 696 for victory. In the England second innings Bill Edrich, with just 21 runs in his five previous visits to the crease in the series, finally relaxed and came of age as a Test batsman by scoring 219. Centuries from Hammond and Paul Gibb as well meant that when the game finally had to be given up as a draw England were just 42 runs short of their target with as many as five wickets in hand. In the marathon innings Norman bowled more than 55 overs and ended up with 1-174. Contemporary reports condemned the wicket, which was clearly intended to last indefinitely, and despite the apparently exciting finale spectator interest had waned long before the game actually closed. Norman had taken 20 wickets in the series, the highest number on either side, and only England’s Hedley Verity bowled more than his 245.6 overs. It is hardly surprising that when recalling the series in 1997 the first memory he mentions is …… the type of pitches we played on. They were all incredibly hard and very difficult for bowlers. It had however been an auspicious debut, but the storm clouds of World War II were gathering and by the time South Africa played Test cricket again, in 1947 in England, Norman was in his 36th year and while he had continued to bowl well through the war he was not part of the party that was selected for the tour. 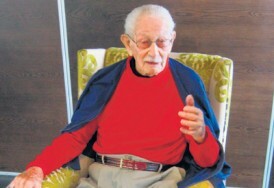 Norman had, back in 1933, been the first Jew ever selected to play for Transvaal, and there have been mutterings to the effect that anti-semitism was behind his omission from the party, although that suggestion seems not to have been something the man himself has ever wished to discuss. As he reaches his great landmark Norman Gordon continues to take an active interest in the game although his eyesight is not what it once was. Neither, equally unsurprisingly, is his mobility and a combination of those two factors meant that he had to stop playing golf four years ago. Nevertheless he remains a keen follower of cricket and is always happy to talk about the game. He never saw Donald Bradman bat, but maintains that of those who he has seen Hammond and Tendulkar are the best there have been, followed closely, in no particular order, by Garry Sobers, Graeme Pollock and Brian Lara. As to bowlers Norman sees Sir Richard Hadlee out on his own. As far as the issues that affect the game are concerned he has no difficulty with the likes of Kevin Pietersen and Jonathan Trott throwing in their lot with England, although his prediction, made after two days of the recent Lord’s Test, that India would win the series against England this summer, and proceed to dominate the World game for years to come, is looking a little wide of the mark. So the oldest Test cricketer of them all has reached his century – I do hope he maintains his concentration at the crease better than he did in his playing days and bats on for a while yet. I will await the interviews that will inevitably follow his reaching this magnificent landmark with great anticipation. Norman is, after all, a man who watched the legendary Ted MacDonald and Jack Gregory open the bowling for Australia against South Africa in 1921. I am not aware that any celluloid fragments of those two legendary fast bowlers exists, and he can have few more precious cricketing memories than those – I am sure I am not alone in wishing I could borrow Norman Gordon’s mind’s eye, just for an hour or two. Excellent article. He also said that Hadlee is out on his own as a bowler. Champion. Amazing that its taken so long for a test cricketer to raise the bat for a ton. Happy birthday Norman. HB Norman, and great article Martin. Hillbrow resident – wasn’t there an interview posted here about a year ago or so? Historical day in cricket history. Great article Martin and hearty congratulations to Mr Gordon. Given your comments in the last paragraph of the article, you may be interested in the following clips which feature very brief footage of Jack Gregory bowling. Great piece Martin, thoroughly enjoyed the article. My cricketing knowledge of some of the players from history is not what it should be, but I can always rely on you to keep me informed!